We offer a wide variety of Ink Jet Printers designed for use with any XL200 Series Controller. Applications include printing part numbers, material gauge, job information, customer names, and more. Printer models available vary depending on the use requirements like line speed and print quality. 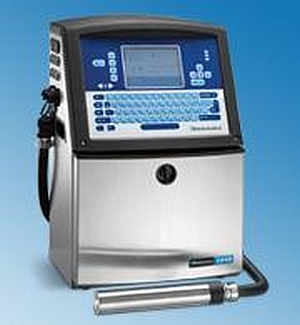 The Ink Jet Printer is designed for use with any XL200 Series Controller. The XL200 Series Controller keeps track of the current status of the orders being produced. At the appropriate time, it passes information to the Ink Jet Printer, where specified information is printed on the part. The XL200 Series Controller has the ability to print certain information such as the part length, order number, and material type. When the XL200 Series Controller is tied to Eclipse Production Management Software additional optional information such as the part number or the company name can also be printed. No longer does the operator need to take the time to manually mark on the part. The job is performed automatically and accurately, with easy to read dot matrix characters by the Ink Jet Printer. Production does not need to stop while the operator determines what needs to be written on the part. Typical uses for the Ink Jet Printer include marking parts with an identification number, part length, or material gauge. Individually marked parts can be a great labor saving advantage, both at your plant and for customer identification in the field. AMS Controls offers a wide variety of Ink Jet Printers that integrate with the XL200 Series Controller. These models include (CIJ) Recirculating Printers to (DOD) Drop-on-Demand Printers from a variety of manufacturers. The type of printer used is determined by the customer’s requirements such as line speed and print quality. XL200 Software supports the following printers, but we do not offer integration kits. Setup and integration is the responsibility of the customer.